If you love Italian flavors but want a healthier alternative to traditional sausage, we’ve got you covered. Premio Sweet Italian Sausage has 60% less fat than USDA data for pork and beef sausage, but with all the flavor you expect from a Premio sausage. Use this sweet sausage to add extra taste to your spaghetti sauce, meatballs, polenta or sandwich. Give up the fat, but not the flavor with Premio Sweet Italian Chicken Sausage. Ingredients: Chicken, Less than 2% of the following: Dextrose, Salt, Vinegar, Lemon Juice Concentrate, Spices (including fennel & black pepper), Paprika, Natural Flavors. Stuffed in Hog Casings. Always cook chicken sausage to a minimum internal temperature of 165° F using a meat thermometer. Pre-heat grill. Place links on grill over medium flame for 25-30 minutes. Use tongs to turn links often until golden brown. Serve and enjoy! I love this chicken sausage. The flavor is wonderful used in sauces and grilling. A juicy, savory Italian sausage sure would hit the spot, but you’re worried about staying healthy and avoiding too much fat. Relax — you don’t have to give up your favorite food. Instead, you can enjoy sweet Italian chicken sausages from Premio Foods. Our chicken sausage has 60 percent less fat than USDA regulations for pork sausage, which means you can indulge without the guilt. We make our chicken sausage with only fresh ingredients and skip the artificial flavors and added MSG that weighs down other sausages. Our chicken sausage is just as tasty as sausage made from pork or other meat. We use butcher-quality cuts of meat to ensure you get the most delicious sausage, every single time. We perfected a blend of spices and seasonings that give the chicken its sweet yet zesty bite. Whether you’re hosting a cookout and want to provide healthier choices for guests, or you’re fixing a stir-fry loaded with veggies, our chicken sausage makes the perfect addition to any lunch or dinner. Whichever you choose, you’ll get a sausage that’s loaded with protein and flavor but not with fat. Keep the bounce in your step with Premio Foods! 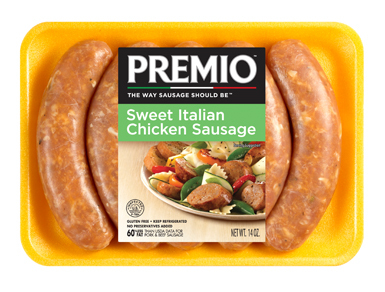 Premio Foods has been making sausage for more than four decades. Our family-owned business understands what it takes to make the very best food while also looking out for you and your family. That means a commitment to quality. We know great food comes from great ingredients, and we refuse to add fillers to our sausages. They’re minimally processed because we know how important whole foods are in a healthy diet. Our commitment to you goes beyond the ingredients we put in our sausages, though. We also solicit your feedback to find ways we can make our sausage even better. We don’t just talk about our dedication to the community — we show it through actions such as donating money for ALS and cancer research, participating in community food bank drives and encouraging our employees to volunteer on their own time. As a family-owned business, we understand how much a small action or word of encouragement can ripple in a community. We’ve also implemented green initiatives to increase sustainability in our manufacturing production, helping to protect the earth and your family. Ready to purchase chicken sausage for your next tailgate or family barbeque? You can look up the nearest location that carries Premio Foods sausage by using our store location tool. Or, you can order directly from our website. Check out our money-saving coupon options before you order to find the best deals. Your family will love the sweet and spicy taste of our Italian sausages and you’ll love knowing you’re feeding them the best-quality sausage around. Pick up your sausages from Premio Foods today.